When you are going on a trip in the wilderness, you need to have the best gear and equipment to make sure that everything is of high quality and perfectly designed for the best and safest experience. For this reason, we decided to prepare the Monkey Paks Tactical Backpack Review to see if it is one of the best products you can take on a trip in the outdoors. When you are on the go, you need a secure and reliable way that would allow you to drink whenever you want to. The lack of hydration on a trip in the outdoors can be dangerous and will cause a lot of adverse side effects on your health. The hydration bladder will be able to provide you with 2.5 liters that you can you quickly sip on in an easy and reliable way. It is an excellent way to stay perfectly hydrated wherever you are. 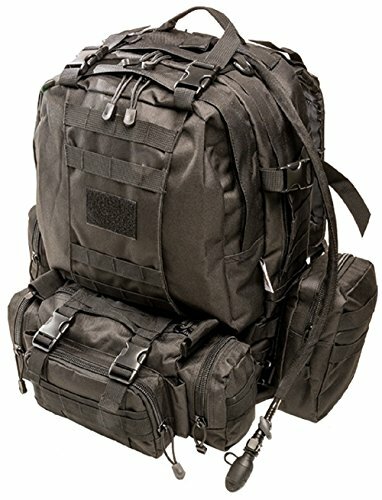 This amazing backpack is big enough to fit all the equipment and gear you will need for a full three days trip in the outdoors thanks to its roomy MOLLE design. 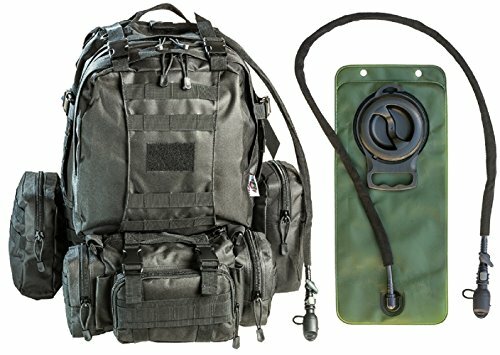 You will have everything you need in case of an emergency or a mission in the wilderness. But don’t worry about having your small items lost inside the roomy bag. The interior is perfectly organized with two internal compartments that will allow you to keep all your items perfectly stored. In addition to that, you will have two zippered detachable side pockets that will help you keep everything perfectly stored and organized. When you are in the outdoors, you need to make sure that you have a great durable backpack that is perfectly designed to stay in great condition regardless of the conditions you are facing. The Monkey Paks pack is made from 600D nylon that is rain and snow resistant and will stay in great shape regardless of the conditions you are facing. The backpack is professionally made so that there will be no tearing thanks to the double stitched seams. It is military quality and will live up to its claims. You don’t need to spend your money on multiple backpacks for different purposes. Thanks to the durable material and the military quality, this backpack is what you need every time for the most amazing time spent in the outdoors. You will not have to worry about multiple packs for different purposes because you will find everything you need with this pack. It will last for long and will deliver the best performance every time. The teeth of the zippers are big and are made from the best materials and are perfectly made to last. Monkey Paks comes with a waist bag or a fanny that can also be worn as a shoulder bag with or without the pack. It has four zippered pockets with a built-in organizer, and this will allow you to keep all your small and valuable items safe. High-quality fabric that is of military quality. Water, snow and heat resistant and will look great every time you use it. Double stitched seams that won’t tear or rip. Large roomy bag with two internal compartments to keep your gear stored. A small waist bag that is perfect for storing all your small sized valuables. High-quality zippers and pocket teeth will not break or bend. Hydration bladder will provide you with 2.5 liters of water to stay hydrated wherever you are. This backpack is not made in the USA. The plastic buckles are poor quality. The side packs are noisy when they touch different surfaces. Q: Is this good to take underwater? A: It is water resistant, but it is not waterproof if submerged in water. Q: Is the hydration water bladder BPA free? Q: Are the waist and shoulder straps adjustable? A: Yes, they are highly adjustable to suit different frames and builds. 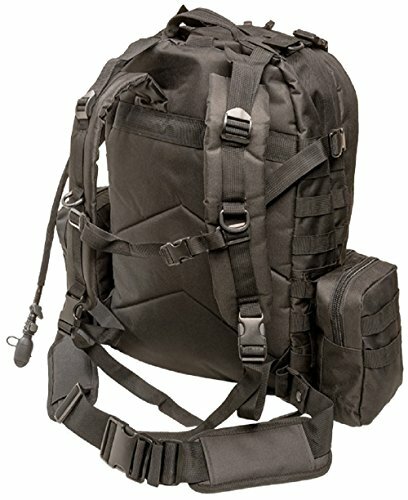 Q: How versatile is this pack? A: You can add a lot of extra pockets, pouches, and compartments to this bag. Q: How much weight can you put in this bag? A: You can put 30-40 pounds provided that you distribute them evenly. We love this pack. While preparing the Monkey Paks Tactical Backpack Review we came to realize that this is the best backpack to use on a trip on the outdoors. It is highly durable and versatile and will not tear or rip even when you fill it with 30 to 40 pounds of weight. It is the best pack to keep all your gear organized and to keep you hydrated on a trip.